Signing up to take part in The Glory of Kings is simple. Just order the game rules book here, and we’ll provide it to you along with a list of positions or countries available to play. You pick one and then get back in touch and then we’ll send you your starting details and the game newspaper! 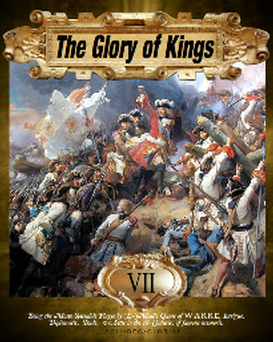 The Glory of Kings is a recreation of the real world of the 18th century. You subscribe to it like you would a magazine, and take part as one of the leading figures of the time, who can range from King Louis XIV, the Sun King of Royal France, down to the likes of the infamous pirate Blackbeard terrorising the West Indies. The game has been developed over 27 years and is tried and tested with a strong reputation and a strong following. It isn’t a computer game but has a great deal of human input and has a brilliant historical atmosphere reflecting this period of history. One game turn is processed each month. Each turn you get the in-period newspaper full of relevant news, reports, articles and game tips, as well as your own specific letters and position details. Turns are priced at £10 each. The rules contain all the information necessary to get you started in The Glory of Kings, allowing you to enter the world as a prince or pirate of the historic 18th century. Adventures are to be had, armies and navies to be led, and countries to be governed. You take part with other like-minded people with a love of history in a thrilling and educational game setting. Gordian Knot, Sacre Bleu, Victory!